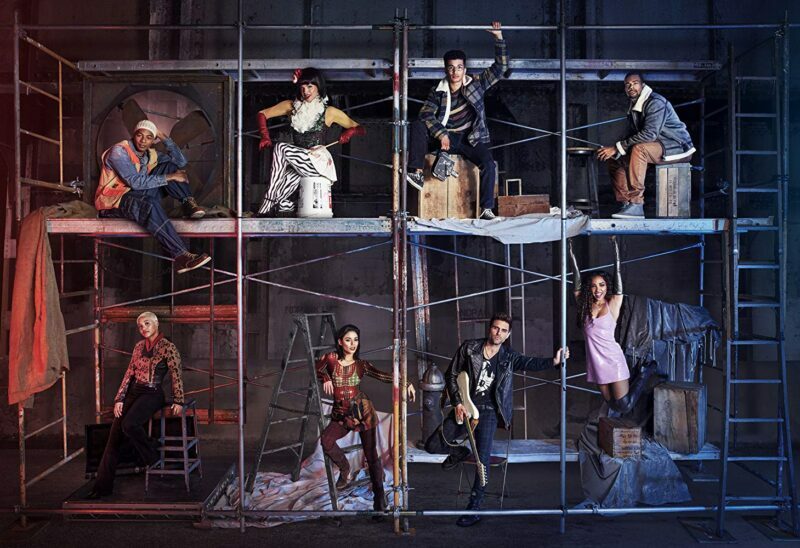 Tinashe, Vanessa Hudgens, Mario, Jordan Fisher, Brandon Victor Dixon, Kiersey Clemons, Brennin Hunt, and James Leyva in Rent: Live (2019). Courtesy of IMDb. The first time I watched Rent, I was sixteen years old. I remember it like it was yesterday. It was a Friday night, and I was at a slumber party with my new group of theater friends. There were six of us packed together in the living room of a friend’s apartment. Unlike my friends, I had never seen this musical. Rent was new to DVD, and everyone else had already watched it ten times. Rent tells the story of seven artists struggling to follow their dreams during a time of social and political trouble. It offers an inspiring message of hope and friendship. And by the time I had finished watching it for the first time all those years ago, I realized that I had found my tribe and I found my voice that I had been looking for. I am 29 years old now and am happy to report that we are still friends to this day. For every important moment that has occurred in my life, they have been there. And Rent is what brought us together. On January 27, 2019, Fox aired Rent: Live! In honor of the musical’s 25th anniversary. What can I say? I loved it! The casting was fantastic, and it was shot beautifully. I found myself getting so wrapped up in the performance that I forgot I was watching a show. Rent: Live! was an emotional and character-driven performance. The chemistry among the actors could be felt during every scene. The staging was incredible. Between the lighting and intricate stage setup, the cast and crew did an excellent job bringing the alphabet district of New York City to life. The performance was nothing short of electric. In recent years, television networks have broadcast live versions of popular musicals, such as The Sound of Music and Hairspray. But I can honestly say that Rent: Live! is no doubt the best one to date. But, as with any live performance, not everything was perfect. Cast member Brennin Hunt broke his ankle the night before the live broadcast. However, the show went on, with the network utilizing clips of a dress rehearsal for Hunt’s scenes, while providing live shots for the final scenes and the big finale. While everyone was expecting a completely live performance, I can’t fault the network for their decision. No one expects to get an injury the night before a show. They could not postpone the performance, so they did what they had to do to make sure the show continued. And I respect the network’s transparency about the matter and their willingness to continue, knowing that there would be some backlash for doing so. There were minor things that happened as well, like missed notes during musical numbers and microphones cutting out. Honestly, those two things did not bother me, especially knowing what we were seeing was not a complete live performance. From my own experience being on stage, things happen that are out of anyone’s control. My biggest complaint of the night, however, was the audience. How do I put this lightly? They were annoying! They were screaming all the time! There was more than one instance when the actors were completely washed out by the audience and could not be heard during major musical numbers. I understand that this is Rent. You will never not find me singing any of the musical numbers at the top of my lungs. But this was not a rock concert. This was a performance of a critically acclaimed musical. You would never see an audience act like that during a Broadway performance or in any theater hall anywhere. The experience was interactive, but the audience was too much to overlook and, frankly, distracting. Maybe that’s what the network wanted? I am not sure. But all of the good that happened outweighed the bad, in my opinion. One of my favorite performances of the night was the opening scene of the second act. The camera pans from Mark — who recapped everything that had happened — to the life support meeting already in session. The camera rests on one of the group’s members. He is not doing well, and I could feel the darkness looming over them all. This is when we first hear “Seasons of Love,” lead by Keala Settle (The Greatest Showman) and accompanied by the rest of the cast. It was a breathtaking and emotional performance. I watched it three times. But the moment that sealed the deal on this performance for me was at the very end. After the final scene, the cast gave a tribute to Jonathan Larson, the creator and composer of Rent. Larson passed away in 1996, hours before Rent‘s Broadway debut. He never got to see his vision come to life. But for 25 years that vision has been honored through every performance, keeping its spirit and central message of hope alive. I can’t think of a better way to celebrate 25 years of Rent than by honoring those who started it all.